A ten volume DVD series that will raise your shooting ability to the next level. A detailed description of each DVD is available below. Studio covers the most advanced fundamentals for all shooters on all three items. Range covers the most advanced fundamentals for shooters on same stance, balance and grip with live fire demonstrations. Gun safety, loading and unloading pistols properly and clearing jams. Covered at range, discussing all four subjects (13:30 minutes). Demonstrated from Barnhart’s high ready, may be applied to any starting position; i.e. the holster, table top, briefcase (demonstrated in volume III, Specialty draws), etc. Calling your shots – range 18:20 minutes. Demonstrates calling your shots on paper and steel targets. Demonstrates presentation of pistol to target with red dot sights, calling shots and multiple shots on one target. Multiple target engagements and target acquisition – what you should be seeing. Note: done with iron and red dot sights. Can be adapted to handgun and rifle competition, self defense, law enforcement and military applications. Target acquisitions drills – range 24:30 minutes. Volume VI and VII have more on this subject. Using steel targets demonstrates on range live fire drills for target acquisition; targets close together as well as large distances between targets. Single and multiple shots on each target. Demonstrated with red dot sight. Magazine changes – studio 32:00 minutes. Classroom inside studio on techniques needed to perform most advanced magazine change methods. Applies not only to competition but also self defense, law enforcement and military situations. Demonstrated with iron sights and red dot sights. Also included are immediate action drills, if magazine does not drop out of pistol and how to handle that situation (the techniques shown for scoped pistol will apply to glock pistol on magazine changes). Studio – 43:26 minutes; covers the most advanced technique of drawing pistol from holster with competition gear – same technique may be applied to other rigs. Classroom – studio first, demonstrated with iron and red dot sights. In addition, drawing gun from table top, drawer and briefcase. Range – 16:32 minutes. Demonstrates different methods of drawing the pistol and shooting shots at targets with both iron sights and red dot sights. Specialty Draws: Studio – 20:00 minutes. Drawing to strong hand only and draw and transfer to support hand and shoot only-classroom. Included; stance, balance and grip that applies to safety; safe gun handling, where to put off safety, etc. Studio – 68:50 minutes. Discussion on eyeglasses, tints and when to use them in different shooting environments. Alterations to holster, belt and magazine pouches; how to set them up. Iron sights and different colors of sights. Magazines and alterations to them. Shoes for different applications. Gun alterations on six different shooting disciplines that Barnhart has won: IPSC, Steel Challenge, Masters Action Event, World Shoot-off Championships, Second Chance, and IPSC Limited Stock Gun Championships. Covers pistols, how they are put together; the manufacturer and gunsmith. Tuning pistols: compensators, ammunition (loads) and temperature and chronograph. Classroom lecture – studio 18:00 minutes. Studio – 60:00 minutes. Classroom lecture and demonstration on how to dry fire successfully. Covers draw to first shot; hands shoulder high; hands at side. Draw sequence starts at about 2.0 seconds and goes down to .50 to first shot. Magazine changes against the timer and Barnhart, starting around 2.5 seconds and decreasing to 1.0 second flat. Multiple magazine changes against the timer. 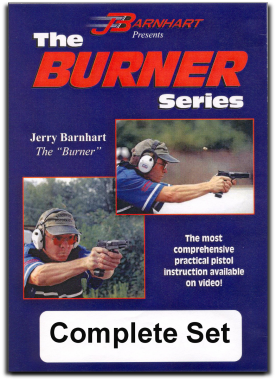 Tape is designed for the viewer to dry fire with Barnhart (using empty weapon and empty magazines). There are audible par times throughout Volume V for viewer to dry fire with Barnhart. Note: more dry fire drills on Volume IX for kneeling and prone. Range – 61:30 minutes. Tape is designed so that viewer will see different approaches to some of the practice sessions Barnhart has at the range. Describing each drill in detail so viewer can follow along; here are some of the drills you will see. During this live fire tape, techniques will be discussed as they apply, also use of the timer and printer will be shown. Times will be shown through so the viewer will know how long it should take for him (her) to perform each technique. Note: shown with iron and red dot sights. Volumes II, VII and X have more live fire drills. Multiple target drills, range – 13:00 minutes. 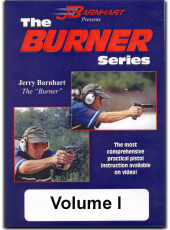 Using all steel targets Barnhart will show you some of his multiple target drills and descriptions. More multiple target drills are shown on Volumes II and VII. Studio – 19:00 minutes. Classroom lecture on how to practice at the range; making the best use of your time, how to go about it properly. Shooting boxes – studio 9:00 minutes. Covers techniques necessary for forward movement into shooting box with use of split screen. Moving into and out of shooting boxes – range 23:50 minutes. Same as shooting boxes in studio but with more instruction on the range and how to apply it into shooting drills. Shown by split screen and with iron and red dot sights. Volume VI has more on lateral movement into shooting boxes and drills. Laser training – studio 10:00 minutes. Demonstrated with pistol and AR-15/carbine rifle. A dry fire approach to shooting on the move. This will enhance law enforcement and military as well as competition shooters approach to shooting on the move with minimum time and no rounds shot to learn the technique. Appearing and disappearing targets – range 17:00 minutes. Barnhart demonstrates his beliefs on how to shoot at moving targets; strategies and practice methods; use of timer and printer. Studio – 23:00 minutes. Classroom lecture on this subject as well as references to some of Barnhart’s experiences. Gun cleaning tips – studio 25:00 minutes. Basic gun cleaning tips; Barnhart demonstrates on limited iron sight pistol, take down and reassembly of Colt “O” frame or 1911 style pistol in .45 ACP. Studio – 14:00 minutes. Classroom lecture and demonstration on proper technique and dry fire with use of timer. Demonstrates multiple methods of approaching this technique. Kneeling position on the range 6:00 minutes. Demonstration of proper techniques and improper techniques and the effect recoil has on both. Prone in studio -10:50 minutes. Dry fire and technique. 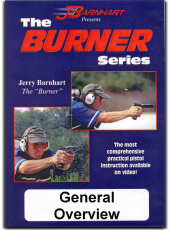 Starting at about 2.75 seconds and decreasing time to about 1.50 seconds; learn and dry fire with Barnhart. Prone at the range -20:00 minutes. Discusses more techniques and effects of recoil to the prone position proper technique versus improper technique. Demonstrated with iron and red dot sights. Engaging multiple targets prone. Studio – 24:00 minutes. Basic physical fitness and diet for shooting (Barnhart learned by trial and error), lecture in studio on these subjects. Coping with match nerves – studio 27:00 minutes. Lecture in studio. Very comprehensive and simple way to approach a course of fire, or the overall match. Making a plan of attack. Courses of fire shown during this segment. Thoughts before a match and where to zero – range 3:50 minutes. Your pistol, iron versus scopes. Breaking down a stage – range 20:00 minutes.